Today was the final day of our work experience trip. We were all very disappointed to be leaving New College Lanarkshire as many friendships and training partnerships had been developed over the last two weeks, but at the same time every one of us is exhausted after the manic training routine. We began the day with a Cross-fit training session which we had previously completed. This time everybody felt much more comfortable during the session as we had gained massive amounts of strength and fitness from our previous sessions. Each of us were pleasantly surprised with the ease at which we completed the workout. Later on we joined the football group for the last time in a training session which involved tactics practice and a full 11 a side match at the end. ​Our overall knowledge and understanding of football greatly benefited from not only this session but also the previous nine days. We are all extremely grateful to get the chance to travel abroad, and everybody is content with how the experience went. Today was the second last day of our two-week work experience placement. The whole group is disappointed to be leaving Glasgow soon, but also looking forward to being back home again. 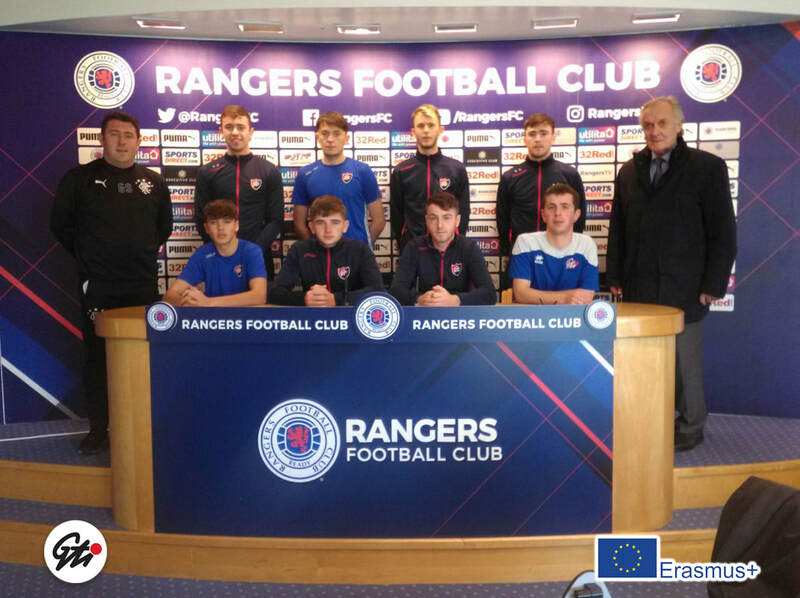 Early this morning we headed to Murray Park to see Rangers academy players training. The facilities along with the training pitches were of the highest standard. We met with the players and coaches briefly before closely observing their session. This gave us a huge insight into the daily routine and lifestyle of top academy players and also allowed us to take in some of the coaching methods and advice. This could greatly help us with our own training as we can use some of their various drills and games ourselves. After this we headed for a short lunch break and then met up with Todd again for another football training session. On this particular occasion only the 8 of us trained. Todd had prepared an easy session for once, which was greatly appreciated by the tired legs of some people. Firstly we played a 4v4 game of football tennis, then quickly moved into a 1v1 knockout tournament. Following this we played small sided matches involving 1v1, 2v2 and 3v3. Everybody enjoyed this session as it was more light hearted but also very competitive. Each of us improved our touch on the ball and our quick decision making while participating in these games. At this stage of the trip we have all become accustomed to the daily routine of pushing ourselves to our physical and mental limits. Each of us has improved our skills and knowledge of the game exponentially since the beginning of the journey. First thing in the morning we completed our diaries before heading outside onto the pitch for a cross-fit training session. This was different to our usual sessions as there was a huge group of approximately 120 people doing the session together. This helped our motivation as we were competing against everybody else. ​The session lasted for around one hour, which was then followed by a much needed lunch break. Later on we returned to the playing pitch for a tactical training session with Todd. This consisted of possession play involving small teams and playing spaces. We finished off with a short match using the full pitch. This session proved very beneficial for each of us as we improved our first touch on the ball, our passing vision, and our decision making. After waking up this morning and prepared ourselves for the day. We met up at the cafe at 9am and left at 9:30am. After departing the Lofts we headed to Braidhurst High School training grounds. After our arrival, we met the coaches in the school. We then watched a training session of u13 students. We saw that the level of coaching and the abilities of young players, developed through training, is at such a high level. The u13s train about 9 times a week through their club and the school. At about 12pm we left the Braidhurst HS training grounds and we headed to Broadwood for lunch and to assist in a SFA goalkeeping course. In the course we did about 9 different drills and assisting as an offensive side. In most drills it was all about the keeper working with his back line. It was a good experience for us to gain as a team and how we could use the experience to use it for our benefit on the pitch. At about 4pm we headed back from Broadwood to our apartments. We relaxed for the evening by watching the Celtic v Bayern match. Today we met up in the cafe at the Lofts at 9am and left for Broadwood at 9:30am. We arrived in Broadwood at 10am and went straight up to the classroom to complete our work experience diaries and make sure they are up to date. After we had them completed we went down to tog out and had a gym session from 11am. The gym session was a 30min session of 5 pull ups, 10 push ups and 15 squats all to do within a minute and repeat every minute. The session was a good one but it is definitely overworking our muscles as most of us were not used to this kind of lengthy exercise. After the gym we had our lunch and after it we had a training session at 2pm. In the session we practiced counter attacking football. We did a couple of different drills which included passing the ball in behind the defenders. It was a very useful session for us as it allowed us to practice getting forward quickly on the pitch and think more offensively on the pitch. After all the exhausting sessions, we were packing to leave Broadwood and finish up with our day. We left at the usual time of 3:30pm and when we arrived back at the apartments we all just relaxed for the rest of the evening. The whole group were looking forward to this day for the whole week. It was a first experience for all of us to attend a Scottish Premier League match at Celtic Park. Kilmarnock were the opposition. Each of us we're amazed at the vast amount of home supporters with approximately 55,000 attending in total. It was a thrill to experience the atmosphere of true support. In the end the game finished 1-1 despite a dominant performance from the hosts. We analysed various aspects of the match afterwards in order to better understand different decisions and incidents, which proved beneficial to us all. Early in the day we travelled to the training grounds and attended a classroom presentation on Sports Psychology. This involved watching motivational videos and considering each other's opinions. It was beneficial for everyone in the group as it showed us how to assess your own strengths and weaknesses to allow future goal setting. Soon after this we performed a gruelling fitness conditioning session in the gym with Todd Lumsden. We had 7 exercises which all had to be completed within 3 mins. Each person must finish the exercises within the 3 minutes and then go again for the next 3 minutes. This was repeated 10 times. We all succeeded in fully completing the workout. Later in the afternoon we had a joint training session with some of the college football players. They were close to our age which allowed the session to be fair and competitive. We participated in various ball drills involving passing and touch practise. Following this we finished with a competitive match. Today was the day everybody was most excited about before the trip even started; the day we go to Celtic FC’s training ground in Lennoxtown, and to Celtic Park, their home stadium. A few of us are strong supporters of Celtic FC and so this opportunity was very special for us. We first visited Lennoxtown to watch Celtic’s u17 squad training at 10:00 am. As we are a group of football players, the chance to catch a glimpse of coaching drills that are being performed at the most elite level was very intriguing. 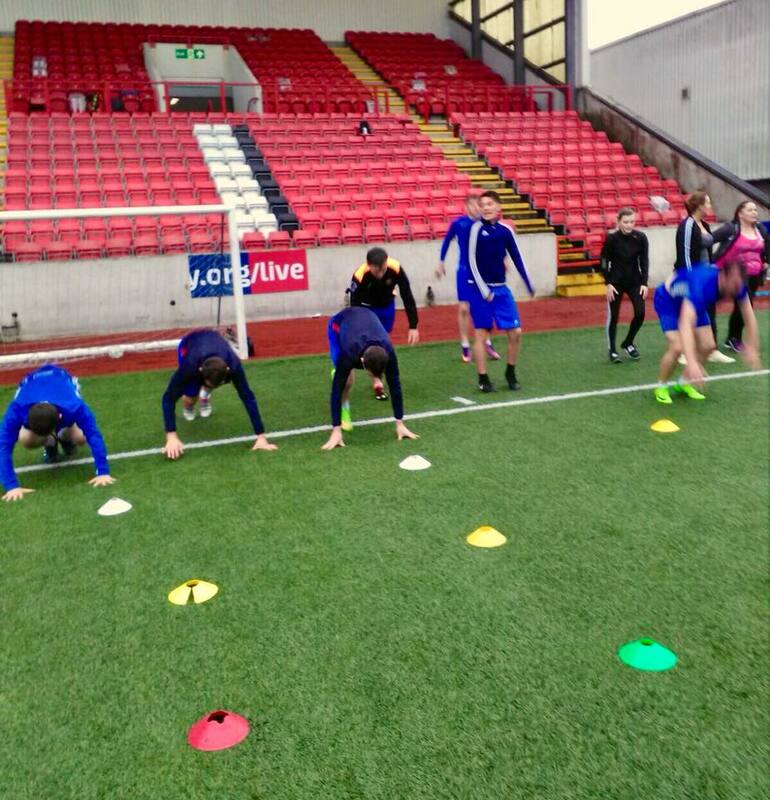 It also helped us to think about our own training sessions and if we could add some of the drills to our sessions. We were astounded at the exceptional quality of the training ground and it’s other facilities. Following this we visited the press room inside and watched a presentation which was delivered by the three coaches who carried out the u17 session earlier on. This granted us even further insight into what these elite level coaches do and also helped us to understand their way of thinking. We were then treated to a top class dinner provided by the club chefs, which was the same dinner as the Celtic players eat on a daily basis. It was important for us to note which foods that were provided along with the quality of them, as this allows us to alter our own diets and eat more like a professional athlete would. At around 3:00 pm we arrived at Celtic Park. this was hugely exciting for us as we have all seen the stadium numerous times on television and were excited to see it in person. The tour guide showed us the dressing rooms, the trophy room, and gave us access to the priority seating areas around the stadium. This was a huge honour for us and we greatly enjoyed it. Seeing the stadium in person really inspired many of us to try and one day reach the achievement of playing on that pitch. Today we arrived at the training ground at about 10:00 am and met with Todd Lumsden, who would be coaching and training us for the two weeks. Firstly, we got to know him for a while before he gave us a 45 minute presentation on Tactical Periodisation. This presentation was very informative and interesting, and it gave us some useful knowledge for our future training. Following this our group then went out onto the football pitch, which is Clyde FC’s main stadium. This was a privilege for us to walk out onto a Scottish League 2 team’s home playing pitch. We met with Todd who then began a fitness test with us, called the Maximal Aerobic Speed (MAS) test. This consisted of a continuous maximum effort shuttle run between cones set 20 metres, 40 metres, and 60 metres away from the start line. The whole group performed well at this as we encouraged and pushed each other along throughout. Everybody gained extra fitness and endurance from this session. The results of this test then allowed us to calculate our speed over the long distance. Following this we then went for a short lunch break, which consisted of soup and panini's. We did not eat anything more as we had another session to think about afterwards. An hour later we then proceeded to meet with Todd in the gym for a tough endurance session. This session started with four and a half minutes of running, followed by 5 sets of 10 reps on three exercises (hang clean, push press, and push ups), followed by another four and a half minutes of running, followed by 5 sets of 10 of the same exercises, then finishing off with another four and a half minute run. This session was extremely tough and it tested the group’s ability to perform. We again helped each other along throughout, with everyone completing the workout in the end. This workout tested our physical and mental strength from the very start, and the group was very proud to have completed it. Later that evening, we all went out to the local Nando’s restaurant for dinner, before relaxing for the evening in our apartments. We were all exhausted from the challenging day, but everyone was satisfied with how it went. We bonded well as a group and also acquainted ourselves with many of the people in the college. The group was full of optimism for the next day despite being largely fatigued. On the first day we arrived in Glasgow after a long overnight trip, we immediately dropped our bags and headed to the training grounds at New College Lanarkshire. Despite the fact that some of us were exhausted, we were excited for the experience that lay ahead of us. We couldn’t believe the high quality facilities that were available at the campus. When we arrived we were greeted by the David Hay, who previously played for Celtic, Chelsea, and Scotland during his illustrious career. For us football fans this was a privilege and gave us a great start to the day. We visited two gyms for induction later on, which proved astounding as we noted the quality and quantity of the available equipment. We later returned to the Glasgow Lofts apartment block which we are staying in for the next two weeks. We were extremely impressed by the size and comfort of these apartments. In the evening we visited the local Yate’s pub to experience the atmosphere during a football match. We ate there while watching Hibernian v Hearts in the Scottish Premier League, with Hibernian eventually winning 1-0. We chatted with some locals who were a similar age to us. It was interesting to hear what they had to say about their own country and city, and it was humorous at times as we each misunderstood the other’s native accents. We later had an early night, which was much needed, but all so optimistic about the next day’s start as we would begin training.